Upon the shelves of the Chapter Library an intriguing version of the New Testament can be found. From the outside the book is impressive: soft brown leather, tooled and stamped, and adorned with brass bosses, the tips of which have been kept shiny with centuries of use, encases wooden boards that enable us to date the binding to the 15th century. 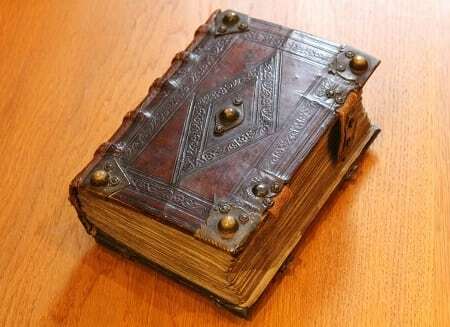 A soft strip of leather, attached to brass plates, keeps the book closed. 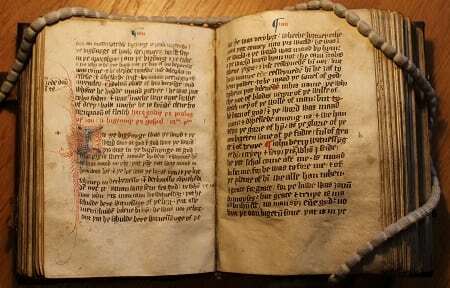 Inside, the text is equally unique; containing a handwritten translation of the New Testament into English that dates from circa 1395-1415. At least three distinct styles of handwriting can be seen in its pages, suggesting a collaboration between several men. The scripts are uneven, indicating that the writers were not trained scribes, but rather literate men who worked together to produce this text. This idea is corroborated by the presence, on the reverse of a page from Colossians, of some writing practice undertaken by one of the men. Furthermore, it appears that the first scribe corrected passages throughout the book and so it was he, perhaps, who was the orchestrator of the translation. There is also the impression that one of the men was more artistically minded than the rest; with a rather amusing face drawn into the illuminated initial that begins the prologue to St Paul’s letter to the Romans. Whilst being full of charm and a work of inspiring dedication, the volume, which was produced at a time when the Church discouraged use of the Bible in any language other than Latin, raises many questions: who were the men who translated and wrote it? How did they go about writing it? Did they make more than one copy? Who commissioned the binding of the volume? We have not yet discovered the answers to these questions, and perhaps we never will. However, certain aspects of the translation place it within a group known as “Wycliffe’s Bibles”. John Wycliffe was an English theologian who is characterised as the morning star of the Reformation. He attacked the privileged status of the clergy and the papacy, and it was his firm belief that scripture was the only authoritative and reliable guide to the truth about God. He encouraged efforts to have the Bible translated from the Latin version used in churches to the commonly understood English. Whilst his direct involvement in translations is difficult to prove, scholars agree that the success of the project was due to his leadership. Wycliffe died in 1384, and it was his younger contemporary, John Purvey, who continued to work on the translations. Commissions in 1388 to search for heretical books indicate that the Church was concerned by the translations. 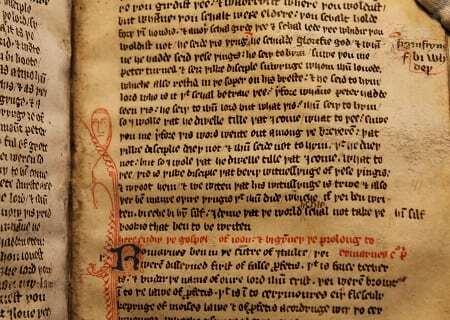 However, there are more than 100 copies of Wycliffe’s Bible known to be in existence today; indicating that ownership of an English translation of the Bible was probably not uncommon in the early 15th century. If you are interested in discovering more about the books in the Chapter Library and the work being done to conserve them for the future, come to the Conservation Open Day in St George’s Chapel on Saturday 11th February.